We made 500 YouTube subscribers! We made 500 YouTube subscribers! Thank you. Doing a giveaway of a $50 Habor Freight giftcard. 1. Make sure you are subscribed and your subscriptions are public. my page on that platform so I can message you. be notified by via their selected platform. They will have 48 hours to respond. If they fail to claim the prize within 48 hours, a new winner will be chosen. YouTube is in no way a partner to this contest and all applicants agree to release YouTube from any and all liability related to this contest. Personal data collected as a part of this contest will be used only for the purposes of this contest and will not be released to third parties. The Brownsville Art Association is holding their annual Junk Art Show. The show runs August 1st through September 15th. Located at 255 N. Main St., Brownsville, OR (the old fire station). The gallery is open Thur - Sat 10:00am to 5:00pm and Tues 6:30pm to 9:00pm. I have three pieces in the show. Below are some pictures I took during the Artist Reception. 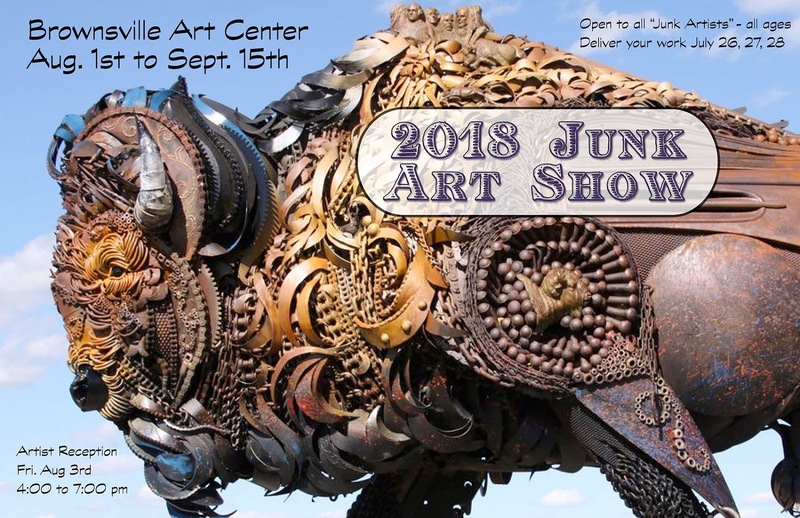 The 2018 Junk Art Show at the Brownsville Art Association runs August 1st through September 15th. If you're in the area, you should stop by and check it out. I've dropped off 3 pieces for the show.